The Latin American afajores cookie is the inspiration for this recipe. Adding goat cheese to the dulce de leche puts a fun twist on a classic and offers something savory to an otherwise very sweet cookie. 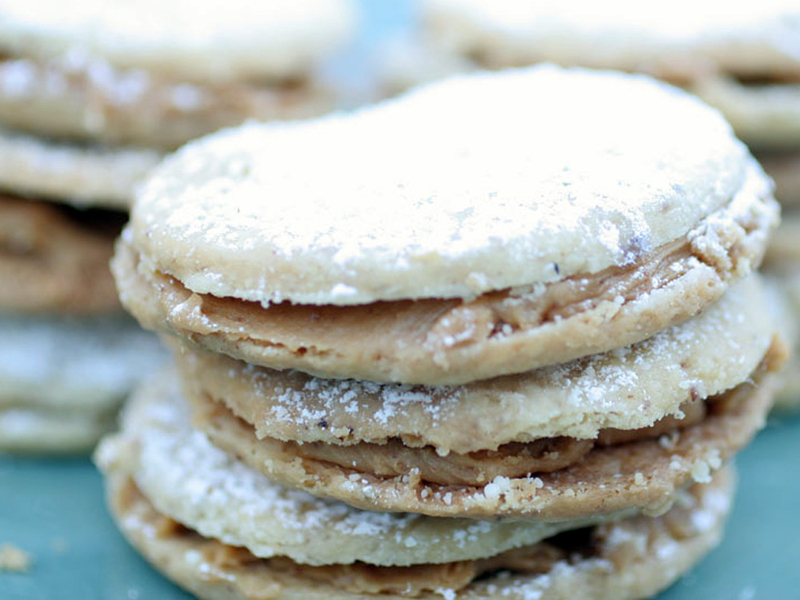 To ensure that the base was not too delicate for the goat cheese and caramelized-milk filling, Dorie Greenspan’s sturdy sable cookie recipe was used, as well as dulce de leche from the Latin American aisle of the supermarket. Goat cheese is perishable, so keep the filling cold and only sandwich cookies that will be consumed within a day. In a medium-sized mixing bowl, whisk the butter and sugars together until light and creamy, about 2 to 3 minutes. Add the yolks one at a time and whisk well. Fold the flour into the bowl with a rubber spatula, mixing until the dough is all the same texture. It will be moist and clump together, but will not be as smooth as chocolate-chip cookie dough. It will be a little crumbly. Lightly stir in the pecans. Divide the dough into 2 balls. One at a time, place each ball on a sheet of plastic wrap. Use the wrap to roll the dough balls into 8-inch logs. Twist the ends of the plastic wrap tight and refrigerate the dough from 2 hours to overnight. Take the dough out of the refrigerator and unwrap. Starting from the center and working out, score (or mark) the log beforehand to identify where to cut the 24 cookie pieces. Mark the center first, then in quarters, then 6 on each quarter. Then, slice the log into 24 pieces. Line 2 baking sheets with parchment paper or silicon mats and space the cookies so they are an inch apart. Rotating the sheets after 10 minutes, bake for 20 minutes or until golden brown. Let cool. While the cookies are cooling, warm the dulce de leche over low heat in a small saucepan, stirring and being careful not to let the caramel bubble. When just warm, take off heat. Add from 3 to 5 ounces goat cheese to your taste, and stir until well mixed. Cool. Sandwich about a teaspoon of the dulce de leche mixture between 2 cookies and continue with the rest of the cookies until finished. Dust with powdered sugar. This entry was posted in Cookies, Desserts and tagged caramel, dulce de leche, fresh goat cheese, nuts, Sandwich cookies by jmbtruefood. Bookmark the permalink.